Sciatica pain is most often caused by a herniated disc that presses on the sciatic nerve, leading to inflammation, tenderness and pain. Turmeric can help relieve pain and inflammation from lower back pain and sciatica in some individuals due to the herb's ability to lower levels of certain enzymes that cause inflammation in the body. Turmeric acts as an anti-inflammatory, which can help relieve swelling and pain associated with sciatica and other types of lower back pain. The spice is available in powdered form and also in capsules and tablets, allowing people to consume it easily if they do not want to add the spice to food. Turmeric is particularly helpful for sciatica pain caused by tense muscles or muscle spasms, since it can help relieve these problems. Turmeric is often consumed in pill or capsule form as a dried extract of the spice when taken for sciatica. A general dosage guideline for otherwise healthy adults is 300 mg of turmeric taken three times per day to help ease pain and inflammation. If you take other medications, this dosage may need to be adjusted. When taken for pain, turmeric supplements often contain bromelain, since turmeric can increase the anti-inflammatory properties of the enzymes in bromelain. Turmeric alone may not be enough to relieve moderate to severe sciatica pain, but it can help take the edge off when combined with other natural treatments, such as heat or ice therapy, gentle stretches and strengthening exercises. In some cases, prescription medications or other medical treatments are necessary to control sciatica pain. Talk to your doctor before taking turmeric for sciatica or to treat any other medical condition. 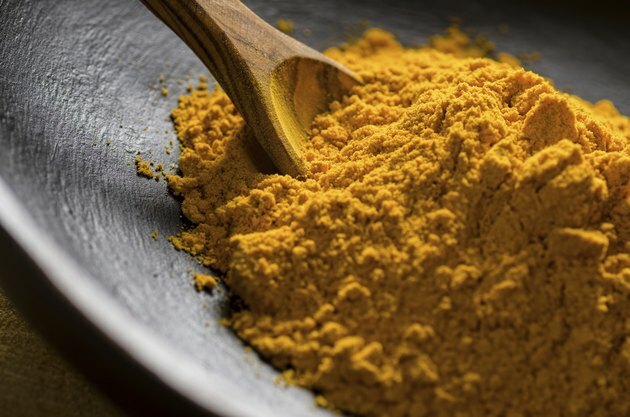 While turmeric is safe for most people, the spice can interact with some medications, including blood-thinners, diabetes drugs and heartburn medications. Disclose any medications or supplements you currently take to your health-care provider before taking a turmeric supplement. The spice can lower blood sugar levels when consumed in large amounts, so you should not take turmeric if you are a diabetic who takes medication to lower your blood sugar levels, unless your doctor advises you to do so. Taking turmeric for long periods can lead to gastrointestinal problems and even stomach ulcers in some cases.